Hamilton Watch Co. 12 size 19 jewel open face pendant-set Grade 918 with 14K gold case. Watch is fronted by a metal dial. 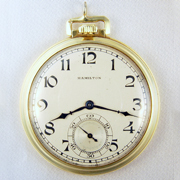 14K gold case has Hamilton factory markings, a Christmas 1929 presentation engraving on its cuvette, and initials on its rear. Movement serial number is 3142668. Gross weight of assembled watch is 39.9 dwt (62.1 grams). Running and a nice looking movement with good color and luster. Dial faces up well with some scattered dark spotting. Case has had a loop gold soldered to the top of its bow as seen in photos. Case is otherwise in strong condition with typical mild wear. Good glass crystal.